Aligarh: Dr Bibek Debroy, eminent Indian economist, author and chairman of the Economic Advisory Council to the Prime Minister today delivered the Sir Syed Memorial Lecture 2018-19 on ‘Revisiting Economic Reforms in India’ in which he discussed implementations of major economic policies since the independence and how Indian economic reforms have blended social democratic and liberalization policies. 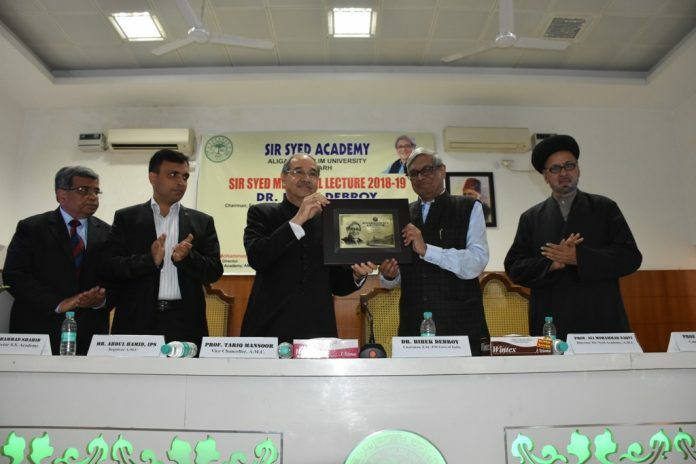 The lecture held at the University Polytechnic Auditorium, Aligarh Muslim University (AMU) was organised by the Sir Syed Academy. Addressing AMU students, Dr Debroy said that since the national competition for a place at India’s best universities is fierce though a sizeable number of the youth hardly get a chance to attend colleges and universities, AMU students are privileged to be receiving education at one of the nation’s oldest and most prestigious institutions. AMU students have the power to change the nation with their fresh and innovative minds and adequate opportunities,” he said adding that this is the University of Sir Syed Ahmad Khan, whose valuable contributions in the field of modern scientific education played a major role in the empowerment of the poor. Dr Debroy pointed out that even though India is on the way to become the fifth largest economy in the world; low per capita income has become a stumbling block for our growth story, which means that despite being an impressive economy, we are a poor country and it is high time that we do something about the average productivity of our citizens. Presiding over the function, AMU Vice Chancellor, Professor Tariq Mansoor pointed out population, corruption and poor governance in countries can result in low per capita income. “There is a need of a proper legal framework and better implementation of schemes at the ground level for betterment,” said Prof Mansoor. Giving examples of southern and Western Indian states, Prof Mansoor said that their growth stories are remarkable because of the best implementation of policies. “India’s strong economy continues to lead global growth, but to sustain rapid growth and raise incomes for the country’s population, all of us need to work together with the youth leading the initiatives,” said the Vice Chancellor. Delivering the welcome address, Prof Ali Mohammad Naqvi (Director, Sir Syed Academy) said that Sir Syed’s reform movement led to economic development as his great vision laid the foundation stone in the educational infrastructure of the country leading to changes in consciousness and economic landscape. AMU Registrar, Mr Abdul Hamid (IPS) was also present on the occasion. Prof F S Sherani conducted the programme, while Dr Mohammad Shahid (Deputy Director, Sir Syed Academy) proposed the vote of thanks.